Reach our business savvy and highly sought after audience who come to read legal analysis and opinions from the nation's premier law firms, corporations, law schools, regulatory agencies and professional associations. Our most frequent visitors are attorneys, accountants, business executives, claims professionals, human resource professionals, and upper and middle management. 375,000 - 500,000+ Average Monthly Unique Page Views. Reaching over 100 countries each month, our audience is global. While 85% of our audience is U.S. based, we also have significant numbers of visitors from Canada, the United Kingdom, Australia, India, Germany and France. One of the highest volume legal website in the U.S., the National Law Review compiles timely, well-researched articles submitted to us from law reviews, law journals, law firm newsletters, bar associations and original thought leadership. 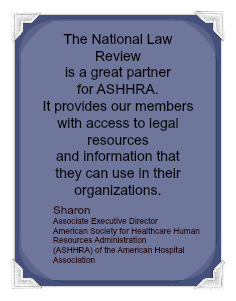 The National Law Review traces its roots back to 1888. The NLR's on-line platform was developed by in-house attorneys as no log-in legal news and research portal designed to capture legal trends as they emerge. The National Law Review is regularly cited by and linked to by other legal publications, government and educational institutions and by main-stream media. Meet our publication and editing team by clicking here. "A" Leaderboard (728x90)- Located on homepage and every article page. Maximum ad rotation of three with an exclusive position available for an upcharge. Email for exclusive pricing. "B" Square (250x250)- Located on homepage, practice group pages, and every article page. Maximum ad rotation of two with an exclusive position available for an upcharge. Email for exclusive pricing. "C" Rectangle (336x280)- Located on homepage, practice group pages, and every article page. Maximum ad rotation of three with an exclusive position available for an upcharge. Email for exclusive pricing. "D" Button (180x180)- Located on homepage and practice group pages. Maximum ad rotation of three with an exclusive position available for an upcharge. Email for exclusive pricing. "E" Rectangle (300 x250)- Located on homepage, practice group pages, and every article page. Maximum ad rotation of three with an exclusive position available for an upcharge. Email for exclusive pricing. "F" Skyscraper (160x600)- Email for exclusive pricing. "G" Half Banner Middle (468x60)- Email for exclusive pricing. "H" Half Banner Bottom (468x60)- Email for exclusive pricing. Maximum ad rotation of three with an exclusive position available for an upcharge. 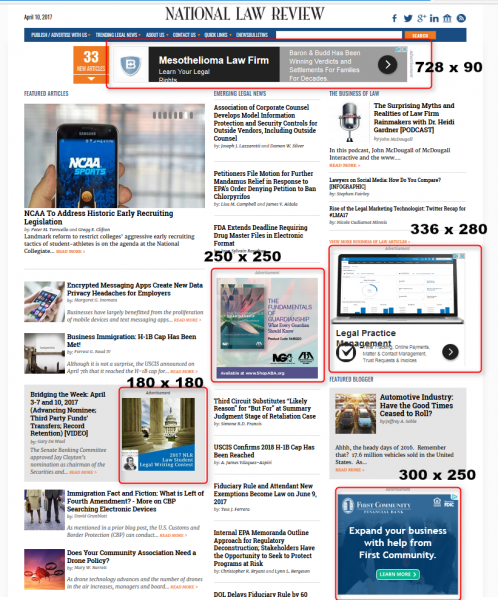 250 x 250 ads have a maximum rotation of two. Email for exclusive pricing. Maximum ad rotation of three with an exclusive position available for an upcharge. Email for exclusive pricing. Static ads only in E-newsletters. Email for specific pricing and ad availability. 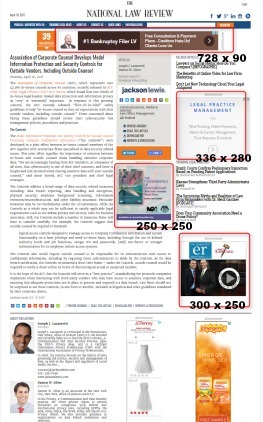 *Upcharge for Litigation and Business of Law e -newsletters. Accepted file types for NatLawReview.com: Animated GIF, GIF, JPEG, Flash / All click-through URLs must open in a new browser window. All prices quoted are net of any agency commission or fees. Creative Business Requirements - the NLR has certain standards and guidelines for ads featured on the NLR Web site, blog and enewsletters to complement the NLR brand and home page. The NLR reserves the right to reject any ad that it feels does not meet its minimum requirements. For more information about advertising with the National Law Review (NLR) or National Law Forum (NLF), please contact Jennifer Schaller.